When you have suffered from a personal injury on a business’s private property or in an automobile accident, you may have the right to sue for damages, including compensation for medical and lost wages. But what is the personal injury claims process if your injury took place on public property? You may have heard the doctrine of “sovereign immunity” and might assume that this prevents you from filing personal injury claims against a government entity. While sovereign immunity and the Federal Tort Claims Act do limit the amount and kinds of damages you can file in a personal injury claim against government agencies, it does not completely prevent you from receiving compensation for your personal injury. In Pennsylvania, there are strict deadlines in the personal injury claims process when the case involves seeking damages from a government agency. 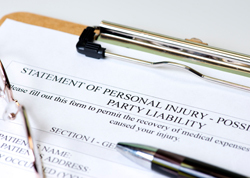 A personal injury victim has six months to file a notice of claim to the government agency. The agency will then either accept or deny the claim. If the agency denies the claim, the victim has the option to sue for damages. If your claim is against a state agency, you are limited in the amount and type of damages for which you can seek compensation. You can only seek compensation for past and future loss of earnings, loss of property, pain and suffering, medical and dental and loss of a loved one or spouse, known as “loss of consortium.” The maximum that can be awarded to you is $250,000 or $1 million in aggregate. If your claim is against a local municipality, the maximum amount in aggregated damages is $500,000. Also, if you have insurance that covers the injuries or damages, any amount awarded to you by the insurance policy is subtracted from the amount awarded to you by the government agency. In order to prove your claim, you must be able to provide sufficient evidence that the property was owned by the agency and a dangerous condition existed on the property. You will also need to supply evidence that the government agency knew or should have known of the potential risk and failed to correct the danger. Knowing what to do when an injury happens can help you greatly when the time comes to prove your claim. Taking photographs of the area and your injuries can help, along with gathering witness statements and property records. Immediately filing an incident report with the agency may also be beneficial. If you have experienced a personal injury on public property, don’t try to wade through the personal injury claims process alone. Hire an experienced attorney who can guide you through the process and deliver the results you deserve. Contact a KBG attorney today.